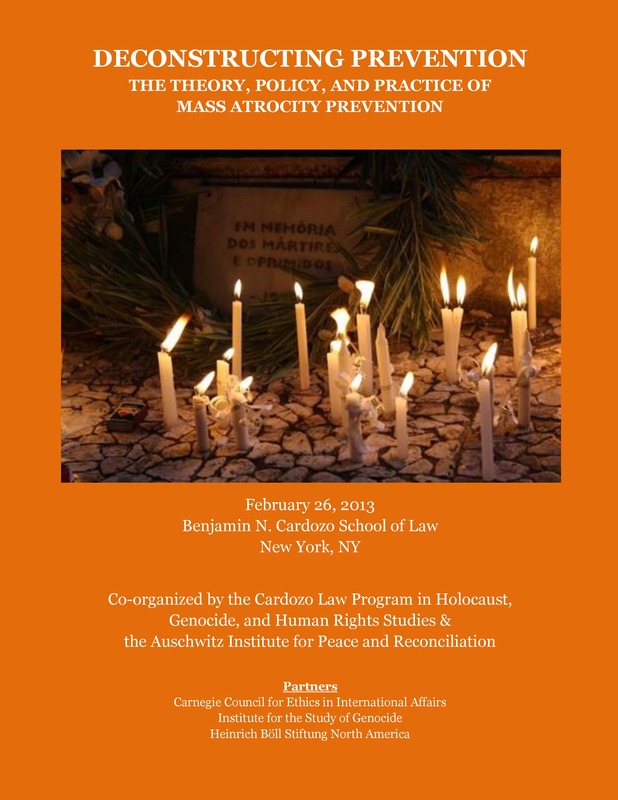 Co-hosted by the Auschwitz Institute and the Benjamin N. Cardozo School of Law Program in Holocaust, Genocide, and Human Rights Studies , the two-day conference aimed to examine the field’s underlying assumptions and advance a common understanding of atrocity prevention among the academic, policy, and activist communities. Presenters on the first panel discussed how the OSAPG has adapted to changing global circumstances, expectations, and norms since it was created nine years ago. Discussants on the second panel noted that transitional justice came into being in the aftermath of World War II and since then has expanded rapidly as a field. They also discussed how and why today’s conception of transitional justice differs from that of nearly 70 years ago. The crisis mapping and technology panel explained how new technology platforms can help predict future events and empower civil society, as individuals have not only a stake but a voice as well. The concluding panel brought to light concrete steps governments in Nigeria, the United States, and Argentina are taking to help prevent genocide, both domestically and internationally. In between the morning and afternoon panels, the Auschwitz Institute awarded its Raphael Lemkin Prize to Dr. Barbara Harff in recognition of her outstanding contribution to the cause of genocide prevention.